Hashing is one of the fundamental techniques used to implement query processing operators such as grouping, aggregation and join. 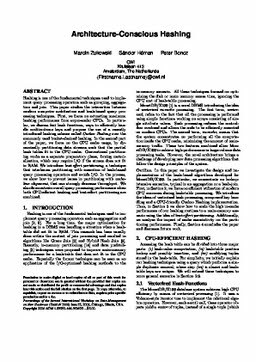 This paper studies the interaction between modern computer architecture and hash-based query processing techniques. First, we focus on extracting maximum hashing performance from super-scalar CPUs. In particular, we discuss fast hash functions, ways to efficiently handle multi-column keys and propose the use of a recently introduced hashing scheme called Cuckoo Hashing over the commonly used bucket-chained hashing. In the second part of the paper, we focus on the CPU cache usage, by dynamically partitioning data streams such that the partial hash tables fit in the CPU cache. Conventional partitioning works as a separate preparatory phase, forcing materialization, which may require I/O if the stream does not fit in RAM. We introduce best-effort partitioning, a technique that interleaves partitioning with execution of hash-based query processing operators and avoids I/O. In the process, we show how to prevent issues in partitioning with cacheline alignment, that can strongly decrease throughput. We also demonstrate overall query processing performance when both CPU-efficient hashing and best-effort partitioning are combined. Zukowski, M, Héman, S, & Boncz, P.A. (2006). Architecture-Conscious Hashing. In Proceedings of International Workshop on Data Management on New Hardware 2006 (pp. 1–8). ACM.